My college friend Laurie asked for recommendations – best places to volunteer with her kid. Too many thoughts for a quick Facebook response, so I wrote this post! If you want to volunteer with your child, here are some questions to start with. What can your child do and what do they like to do? If your child can do something, they can volunteer that skill. Bonus if they enjoy it. Read, paint/color, fold laundry, play games, bake pies, pick up litter, sweep, vacuum, rake, tell knock-knock jokes, write letters, run, bike, sell things (stand at a busy spot, look cute, and call attention to the cause)…all of these are volunteerable skills. What places do your family members already frequent? Volunteering where you already go is a great choice for children because they are investing in a place that has brought them joy already, and where they can return to see they fruits of their labor. Schools always need volunteers, even children! Older kids can help set up and take down chairs for special events, help babysit younger kids during parent meetings, and run movie nights or other social events. Libraries, after-school programs, and preschools may welcome big kid readers. Parks and playgrounds have formal volunteering (groundskeeping, etc. ), as well as informal volunteering — picking up litter, toweling off playground equipment after a rain, reporting graffiti to the parks office. Theatres and concert halls need ushers, and also people to pick up old programs and trash after the performance. Children’s productions might be more kid-friendly, and allow your child to watch a program for free. If your family has a faith community, look for ways to volunteer through your temple, mosque, or church — visiting elderly and home bound members of the community, raking the grounds, making meals for people who sleep outside, or passing out flyers for an upcoming blood drive are some examples. What kind of issues or people are important to your child? If your child likes animals, you may find an animal shelter, zoo, or rehabilitation organization that welcomes regular and loving visits from children. Children who have close relationships with their grandparents may enjoy creating colorful cards and greetings to share with Meals on Wheels groups in your community, to distribute along with meals to home bound older adults. Local assisted-living facilities may welcome your child at certain times to spend time with the residents. If your child has struggled to understand homelessness and panhandling on your city’s streets, you might bake desserts to bring to a nonprofit that feeds people for free (ask for guidance first), or get together with friends to assemble care packages to distribute on the streets. What values would you like to demonstrate or strengthen? While the suggestions above are child-centered, you as a parent might be interested in broadening your child’s horizon, sharing with them something you care about. Parents with a deep sense of environmental justice might want to introduce their children to the importance of clean waterways — to protect aquatic animals from eating toxins. Picking up litter during beach or river cleanups is a way to volunteer. Or parents may help their children understand the danger posed by invasive plant species — by identifying and clearing invasive species in natural areas. Parents who care about maternal and child health in low-income communities can find ways to collect and pass along baby clothes and gear, parenting books, and other resources to high schools and community centers. Children can fold clothes, organize their friends’ families to donate, and help carry donations. And of course there’s the lemonade stand — with proceeds going to organizations you and your child value. Similarly, there are charity fun runs and family bike rides where the volunteering is an athletic contest, and the benefit is the financial support of an organization you value. Some “friends of rivers” organizations even offer canoe rides! Do you want to volunteer with a group, DIY, or with an individual organization? A final question to ask is whether you want to volunteer with a group like the Scouts or a youth group, OR whether you want to create your own volunteer gig, or whether your child wants to become a regular/formal volunteer with a specific organization. Asking this question can help you narrow your options and hopefully help you pick a way to start! Something I’ve noticed lately is that the more time and energy you invest in a person or an activity, the more you grow to love it. …or maybe about feeling satisfaction from your efforts, so that you are shaped by the care you give. So this morning, reading about the “new American rite of passage,” which is meant to be a year of national service, my imagination automatically takes me to a time when every U.S. citizen has the chance to invest time and energy in their community (or any community). I see faces of adults (national service alums who are now parents, teachers, bankers, florists, landscapers, librarians, mayors, bakers…) who have struggled to understand the points of view of diverse people and systems, to affect change in the lives of others, who’ve created wiring in their brain for people and places on the margins. Who’ve been transformed, or “ruined for life” as Former Jesuit Volunteers claim they’ve been. I see individuals passing their learned insights onto their children, their value of giving. The name of this blog comes from the notion that “The Service” is a nickname for military service, and that new generations of citizens have the chance to form a new service — meaningful direct and indirect service here in the States and elsewhere. My grandfather, a WWII vet and internee, said to me when I was a Peace Corps Volunteer serving in China, that he was proud of me for serving my country. I can’t describe how much his words meant to me. Naturally there are many subcultures in which “service” looks exactly like being a member of a community — service isn’t always joining a program, moving to a new place, tracking your hours, and following a Federally approved position description as an AmeriCorps member. That said, I’m excited to see what comes of the movement, both what comes next and what comes in time for the current generation of children when they are ready to come of age. For a course in training needs assessment, I have been researching the career transitions needs of AmeriCorps members in Oregon the past couple of months. conducted a pilot study, specifically a survey of 41 Oregon AmeriCorps and VISTA members who are within four months of ending their terms of service. The pilot study focused primarily on career pathing and networking — skills, attitudes, and performance needs. It’s interesting what is rising to the surface. The first thing that jumped out at me in general was that members are thinking about their post-AmeriCorps plan far earlier than I had anticipated. 81 percent were thinking about next steps by Day One of their term. I was thinking the majority would hover around the 6-month mark, once they got a handle on their service project. A paradox emerged from the data on networking. The majority of members who responded to the survey rely on networking (with people more established in their careers, as well as with friends and family members) as their top strategies for investigating next steps. However, the vast majority of members also find networking problematic in a range of ways — from not knowing whom to network with, to feeling like they are bothering the people they want to network with. In fact, only 24 percent of members said networking was unproblematic for them. 88 percent are optimistic/hopeful about the end of their term and their transition to next steps (compared with 65 percent who find networking problematic, and 70 percent overall). 50 percent are “anxious/worried” (compared with 59 percent who find networking problematic, and 56 percent overall). I’d love to know whether people with a good attitude towards their next steps also happen to have a good attitude towards networking — or if there’s a causal relationship (in either direction) among the two. The other skill area I looked at included career pathing. I started by looking at survey results for people who report having their plans “firmly in place” — but the arc of their responses for all other questions looked really similar to overall responses. What’s fascinating to me about this set of numbers is that if I just look at people who are planning to get a job after the corps, a huge number are anxious (72 percent for job seekers overall; 54 percent for those focusing on their professional role) or at least uncertain (64 percent for job seekers overall; only 45 percent for those focusing on their role). 69 percent are excited about the transition! No one else is excited about it. Well, only 26 percent of others are excited about it. It appears that focusing on the role you’ll play in the workforce ain’t a bad strategy — at least if attitude is a good indicator. It may be that when you focus on role, you’re relying more on yourself and leaving less to chance or others. Literally, this group relied relatively less on networking (though they did network! ), more on reflecting on their own strengths and weaknesses, and took advantage of a wider variety of career resources available. An area for further investigation is, do the frequent opportunities for in-service training offer additional benefits to people entering their career through the lens of role? — because training is often more tied to specific job skills (like grant writing, for VISTAs) than issue. These initial findings are really tempting me to keep researching (beyond the scope of my class). 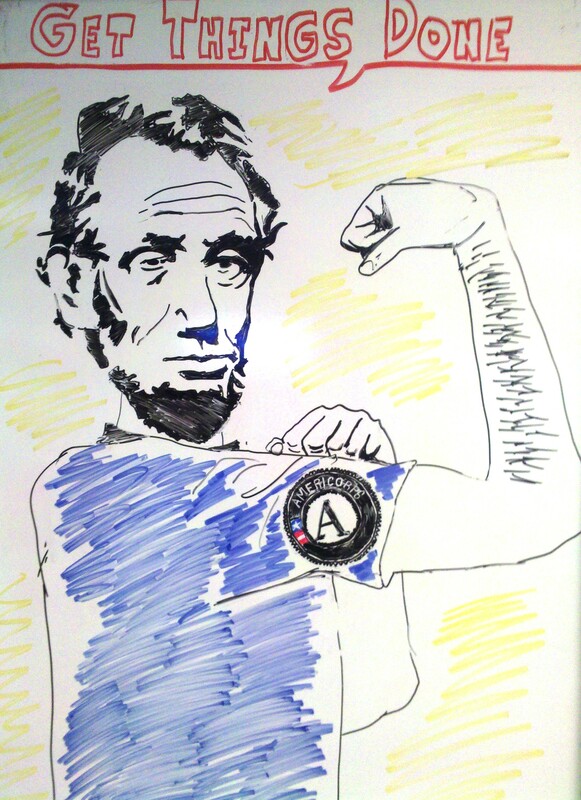 Happy AmeriCorps Week, by the way! If you are in a public service career and carrying—or considering—student debt, your life just got a little easier. Heather Jarvis is a national expert on public service loan forgiveness who contributed to student debt relief policy for the House Education Committee and others in Congress. Her new site is a clearinghouse of information about managing your debt while working in a mission-based career. IBRinfo is an independent information hub about income-based student loan repayment and public service loan forgiveness – two relatively new federal programs that help student borrowers afford an education. As-needed email alerts with news that counts. When an email appears in my inbox, less than monthly, I read it. It’s always valuable information. If you don’t believe me, you can also just read the email alerts on their site. For former AmeriCorps, VISTA, and NCCC members out there, check out the official CNCS website on the Segal AmeriCorps Education Award. The Education Award—around $5,000—can be used to pay back student loans and/or to pay tuition at qualifying schools. This week, Lara Galinsky, Senior Vice President of Echoing Green, is launching an inspiring career guide for social impact work called Work on Purpose. We interviewed Lara about her new book. Click here to listen now! Each chapter of Work on Purpose asks key questions for career seekers; illustrates the impact of these questions in the lives of Echoing Green community members; and offers a place for notes at the end for you to jot reflections from your own life. Cheryl Dorsey, President of Echoing Green, who graduated from medical school and Kennedy School of Government, and chose social-justice over medicine. Mark Hannis, founder of the Genocide Intervention Network and the child of Holocaust survivors, who discovered as a college student that genocide still occurs, and that he could mobilize action to end it. Mardie Oakes, founder of Hallmark Community Solutions, combined her background in architecture, community housing, and finance to develop housing for people with special needs. Socheata Poeuv, creator of the film project Khmer Legacies, which documents interviews between Khmer Rouge survivors and their adult children. Andrew Youn, Founder of the One Acre Fund, who started out in a corporate consulting job but later used his business skills to develop a market system for farmers in a region of Kenya to prevent annual famines. Click here to learn more about Work on Purpose. Shirley Sagawa, left, spoke with me, right. Want to hear insight from the “founding mother of the modern service movement”? You’re in luck: our newest podcast is up now! For National Volunteer Week, I interviewed Shirley Sagawa, author of The American Way to Change: How National Service and Volunteers and Transforming America. During the first Clinton administration, Shirley drafted the legislation that created AmeriCorps and the Corporation for National Service. In his 1995 book, How a Bill Becomes a Law, Steve Waldman compared national service—full-time stipended volunteering like AmeriCorps and VISTA—to a Swiss Army Knife, “performing numerous useful functions in one affordable package.” In today’s show, Shirley revisits the Swiss Army Knife analogy with some timely new insights that she also shares in her book. Click here to learn more and listen to the podcast.